I’ve been an AT&T U-verse customer for a few years now, and I’d say I’m at the “very satisfied” level of satisfaction. I get good internet speed, free HBO (3 months at a time), and wireless cable receivers. I’ve only had one problem when my DVR crapped out, and that was fixed promptly with a replacement. Last month, they called me because they “noticed that I didn’t have any active promotions” and proactively lowered my monthly bill by about $60. I love them! Yesterday, I called their Rewards and Rebates customer support line because I moved to a new house last summer, and there was a take-us-with-you promotion that offered a prepaid Visa gift card for transferring qualifying U-verse services to a new address. I don’t remember the details now, but they put a note about the promotion on my account when I was transferring the services last year. I think it was just because I had asked about the promotion and the customer rep decided to add a note just in case the reward didn’t trigger automatically–good thing we did that! When I called yesterday, the guy I talked to read the note, reviewed my account, and issued the reward with no questions asked. I didn’t even have to wait on-hold to talk to anybody despite the standard we’re-experiencing-high-call-volumes-at-the-moment automated warning message. It was a completely painless customer support experience! After contacting any customer support, it’s not unusual to receive a “Thanks for contacting support!” email. 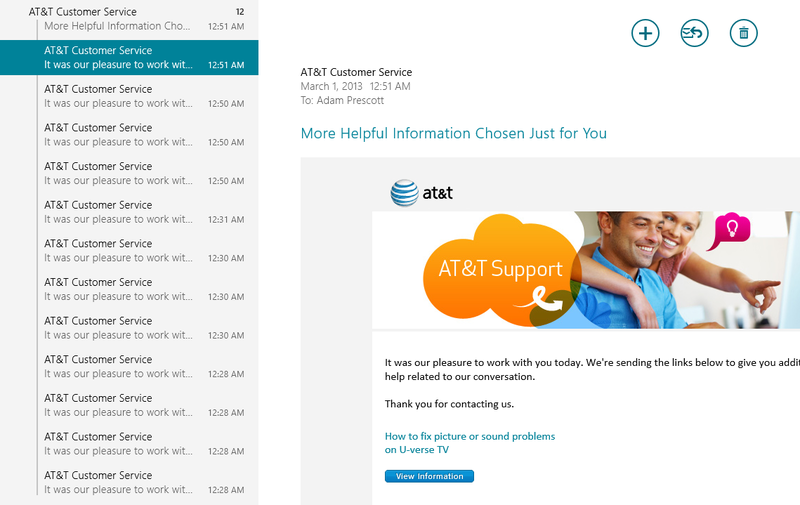 AT&T went the extra mile here–in a bad way–and sent me twelve of those emails overnight. TWELVE! It was our pleasure to work with you today. We’re sending the links below to give you additional help related to our conversation. And then each email had a different link for fixing a common problem, none of which were related to the reason I actually contacted support. But, hey, at least I’ll be in good shape if I ever need to know How to fix picture or sound problems on U-verse TV, How to fix sound problems on U-verse TV, How to launch and use AT&T Troubleshoot & Resolve, Troubleshoot U-verse: Internet, password, and email – video, Update credit/debit card or checking/savings account information, How promotions appear on your bill, Travel with U-verse, How to use Wi-Fi at AT&T hotspot locations, Perform or schedule a virus scan with AT&T Internet Security Suite powered by McAfee, Learn about AT&T Internet Security Suite, Prepare your computer to download and install McAfee Consumer products, or Download and install AT&T Internet Security Suite powered by McAfee! Thanks for all the proactive support, I guess. I’m still a raving fan of U-verse, though. If my only complaint as a customer is that you sent me too many thank-yous after contacting support and resolving my issue, you’re probably doing okay. Wireless TV Receivers from AT&T U-verse! I’m so excited that AT&T U-verse has come out with wireless TV receivers. I have not had cable in my upstairs bedroom for the 6 years that I’ve lived in my current home due to the fact that the wiring was not in-place. I’d been told by multiple companies that I couldn’t get cable installed up there without tearing through the walls or running a cable up the side of the building, and I haven’t been ambitious enough to do such things. I’d dream to myself–why can’t they just come up with a wireless receiver? I can stream wirelessly from my computer, so why not do the same with TV? Well, my prayers have been answered, and I am so happy! I ordered my wireless receiver from AT&T the day after I found out that they offered it. They charged me a one-time fee of $49.99 plus $7 per month, which is the same as a second non-wireless, non-DVR HD receiver. It arrived in the mail two days later, installed in minutes, and has worked flawlessly since. There are two pieces to the setup. A small access point that plugs directly into the U-verse home portal (or whatever they call it–the router), and the wireless receiver. When you turn them on, you pair them much like a bluetooth device. And that’s all there was to installation & setup. I have a Focus v1.3 on AT&T, and it was announced that the Mango update was available for me. I got home from work super excited, but when I went to my computer, Zune told me that there was no update.